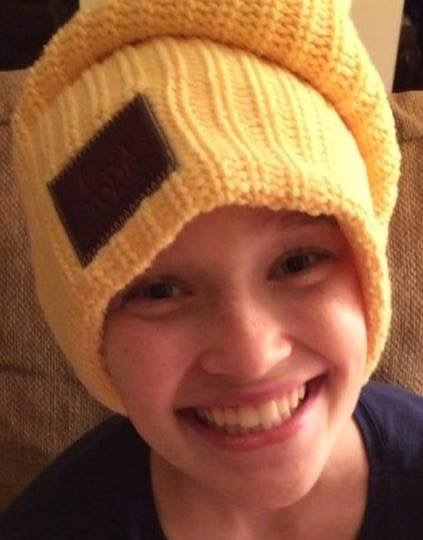 My youngest daughter, Kylie, was diagnosed with Ewing’s Sarcoma on April 9th, 2014. All of her life, people called her Smiley Kylie and she fought bravely for ten months. You can read about our discovery of it here. On February 13th, 2015, her battered body succumbed to the disease. She left her family with two missions, take care of her kitten and kill childhood cancer so that no other child has to die. My posts about Kylie and our fight are in their own category. Besides marveling at my keen fashion sense, you might think it foolish for me to come to the podium. But I’ve never been one to heed good advice or shy away from making a fool of myself. I am here because I have a point to make and I need you to hear it and I need you to remember it. It is what Kylie would want you to know. This wonderful school has taught my children that repetition is helpful to learning, so I want to repeat my point, just in case I have to exit the stage in tears. Many of you know that Kylie was a huge surprise. Thirteen years ago, Robin had a persistent stomach bug. One particularly tough Friday, she called my office and asked me to get a pregnancy test on the way home just to rule that out. Remember that we already had three daughters under 6 years old at the time! So along with the test, I picked up a gallon of ice cream just in case. Our life has never been the same. The name Kylie is Australian for Boomerang, so named because the girls kept on coming. We joke that we stole some other family’s first child because Kylie had all typical tendencies of an eldest child. She was a perfectionist, eager to please, and a diligent worker. She was always our sunshine. Joyful. Loving. Our peacemaker. She gave the best hugs. From her earliest days, we called her Smiley Kylie because a smile was never far from her face. I learned a lot about Kylie over the last year. I saw more of her tears than a father should ever see. I saw her bite her lip while a nurse pumped poison into her body, knowing that it would soon make her retch. I always thought I knew what strength was. At a frail 75 pounds, Kylie was the strongest person I will ever know. During her treatment, there were tears, angst, cries of terror, and fits of rage – yet every day also contained smiles, hugs, warmth, joy, praise, and enough laughter and love to beat back at the enemy on her terms. Kylie will forever be my hero. I don’t understand why this was God’s plan for Kylie. I have struggled with that every hour of every day since we knew her death was imminent. The question is, does it matter if I know? I also don’t understand quantum physics, gravity, women, the rules of punctuation as they apply to semi-colons, and most basic mathematics. Yet they still exist. If I never learn any of them, that doesn’t make them less real or binding. So it is with God. While I may never understand his plan, that doesn’t change the fact that he is on his throne, He is good, and He loves us. During the past year, He showed himself real to us over and over again, yet for some reason, he chose not to heal. Why? I do not understand. This girl is awesome! She has changed my heart on many things. I have been praying for you to feel well enough to go to your Gala. Honestly, I have not prayed for anything or anyone so fervently in over a decade. Thanks Kylie for bringing faith back to my life. Your daily strength gives me a reason to have faith in God again. I just wanted you to know that our family prays for Kylie and through her journey and faith, she has brought us closer to Christ. Because Kylie’s story weighs on our hearts, we find ourselves praying more not only for Kylie, but more often than we did in the past. Kylie, through your struggles and faith, you have changed our spiritual life. Thank you. I began following your facebook page as a student in nursing school and realized that God has called me to focus my work on childhood cancer. Before every test, I would make a list of names of people who inspired and motivated me to keep studying and do my absolute best. On February 6th, I received my nursing license with Kylie’s name on the top of my list. I have been so selfish in my past and am guilty of the poor, pitiful me garbage. However, since I began to follow Kylie’s page, I have changed as a person. You are so positive and strong. Seeing your posts reminds me every day that no matter how bad I think something is in my life, there is always hope. I do not know you personally, but you hold a place in my heart and soul. I pray for you every day and I want you to know that every day you are an influence on my thoughts and the way I perceive things that happen. It’s kind of a “What would Kylie do?” situation… and most of the time I think to myself that Kylie would smile and just dance. I love her because she always had a smile that would brighten your day. I never smiled. I didn’t know how, until I saw Kylie’s post. She taught me to live! I had given up on life and all in it. Thank you for sharing her with us. Wow! That’s my little girl! And it is just a small sample. I wish I could honestly say that I have affected as many people in my 47 years as she did in her 12. So what would Kylie do with this God that we don’t understand? To answer that, I’d like to read you something from Kylie herself. I know what scanxiety is like and can understand what you’re feeling right now. Recently, I had the scan that revealed the tumor in my jaw. It was scary going into that scan because of the immense amount of pain in my jaw, but a previous scan had made them think it was not a tumor, so I wasn’t expecting the news. I’m praying so hard! Scanxiety is the worst. Don’t ask why, but look at what you know, and admire what God has shown you. I think it is easy to focus on what could happen. Instead focus on what wonderful things have happened and that God has a plan for what is ahead. Kylie impacted the lives of so many people, but why did she have to lose hers to do so? I don’t know and I may never know. But I know that God is on his throne and because Kylie told me to, I won’t focus on unanswered questions. Instead, I will focus on the wonderful things that have happened… like the 12 years she graced my life. I encourage you to do the same. Maybe you were the kid who finished their test before everyone else. Maybe you were like me and had a page full of holes and eraser shavings, scrambling through question 7 when the teacher called time. Many of the teachers here can attest that Kylie was an excellent student who finished her tests on time. We’ve talked in the family and want to assure you that Kylie didn’t die early. Her life was perfectly complete. She finished the test. She got an A+. It only took her 12 years where it will take most of the rest of us much longer. Over the past year, I’ve taken so many pictures with this phone, many that you will never see because Kylie always had full right of refusal and often said no. Kylie would be shocked and humbled that so many people are here today. If you’ll indulge me, I’d like to take one more Smiley for Kylie of all of you in your yellow. And you have to smile whether you want to or not – because that’s what Kylie would do. I thought I would stop in and let you know I have been thinking of Kylie. I just liked your FB page so I can keep up with her progress. Prayers! God is not good. He’s bad and wants us to suffer. I am so sorry for Kylie. I lost my girl 1.5 year ago to brain tumor. I may not understand many things, but one I know: if there is a God, he is not good. Take care. I am sorry for your loss, sad-mommy and while I don’t agree, I do understand your feelings about God. i am so sorry for all who have been touched by the loss of their child, it is a never-ending pain. God has a plan for what is ahead. I never thought of the future that way. I always knew God had a plan. But…when Kylie said God has a plan for what is ahead…that is so incredibly true and comforting. I wish I had known Kylie. I wish I could have thanked her in person. I’m retiring in 6 weeks and it is frightening to me but to believe that God has a plan for what is ahead…well it’s changed my whole outlook. I can’t go wrong with God knowing and planning for what is ahead. Thank you Kylie for a future to believe in and for your perfectly complete 12 years of life that have changed the rest of mine. Very sweet comment. Thank you for letting me know about her impact on you. That means a great deal to me. Kylie will forever be an inspiration to me, and i cannot wait to order your book! I’m writing this with tears in my eyes, Mark. God bless you and yours, my friend. Thank you for being willing to bare your soul to tell the story of Kylie and how it has changed the whole family. I feel privaledged to get to know Klyie through your words and I never will forget her. I had no idea that there is so little going into research for cures for children. She’s a wonderful little girl and I have learned a lot from the way she went through her battle. The story reminded me so much of another child that I knew of and read the parents blog all through his illness and also since. He also loved the Lord with all his heart and fought hard. It is called, “Jordan’s Healing”. He also the youngest of three boys. They too face the heartbreak and treasures of reminders. I can’t say that I understand what you are going through because it has never happened to me but I shed tears from a mother’s heart as I read your book and I am proud of the way you and your family are continuing the fight to change the way the medical system looks at children’s cancer. May the Lord bless you and keep you! Thank you so very much for reading about Kylie and contacting me. She truly was amazing in how she kept her faith throughout – an example to us all. I pray we can have an impact on funding for our children. God bless. What a beautiful piece! I am so sure that Kylie had the best childhood as she could have had with a father like you. God is truly amazing. Thank you so much. That is very kind. She was an amazing little girl and the world is poorer for her loss. Thanks for sharing this Mark. It still has ministering power. Helps me dismiss my own “why?” B Blessed! Thank you Lilka. Why seems o be an unanswerable question.